Here is the first boat I ever built from scratch. I think I built it in 1982, when I was a young father; my daughter Emily was born in December of 1981. There was never any question but that I would work on boats over my lifetime. Some of my earliest vivid memories are of my Dad building a 16-footer (named Broadbill, of course) in the shop at East Islip Lumber. The lumberyard was owned by Brud Skidmore, and my Dad – never without second or third jobs to augment his policeman’s salary – did custom woodworking there in his “spare” hours. We kids played with the cutoffs in the sawdust. We always had boats and there was always work to be done on them. The maintenance chores were OK but it was the customizing – usually on gunning boats – that was most absorbing. I was usually at my Dad’s elbow, watching, listening, and occasionally holding parts at key moments. 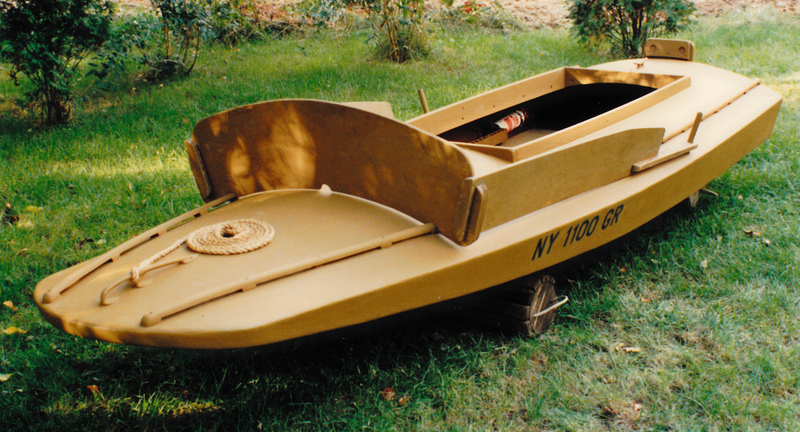 The first thing I ever built from my own design was just a rowing stool for our grassboat. At age 12, I was old enough to use the band saw unsupervised and so just did it while my Dad was at work. I bought my first boat when I was 17. It was a 16-foot garvey, the common clamboat on Long Island’s south shore. I, of course, had to modify for my own clamming forays. I enlarged the cockpit, built a console complete with windshield and canvas, and fitted it out with chocks to hold my clam rake and a culling box to keep only the legal clams on board. Before I started my first duckboat, I had restored our 21-foot gaff sloop Willet and built my first gunning coffin (plans and instructions on this site). By 1982, I was serving as DEC’s Wildlife Biologist out of the Stony Brook office. After gunning with just the coffin – which fit inside my VW Rabbit at the time – for a season, I needed a real boat to expand my gunning horizons. I had our scooter for late-season gunning in the ice but needed a grassboat to explore – and exploit – the bays and marshes I was working on all around Long Island. At first, I was going to use a cast-off puntie – exactly like the ones pictured in Connett’s Duck Shooting Along the Atlantic Tidewater. It had come from the Pattersquash Gun Club and was probably 50 or 60 years old. Its cross-planked cedar bottom needed replacement and many of its sawn deck frames were badly cracked. I think I may have replaced its rotted stem and then decided I would be ahead of the game starting from scratch. A key consideration, too, was the realities of modern-day Long Island. Unless one lives on the water, one needs to trailer the boat and then motor to the gunning spots. A planing hull was in order. By the time I drew up my plans, I am sure I had drawn something similar for many years – most often in high school study halls and later college lectures. The design criteria were: a one-man boat with a planing hull. It would be decked over with a cockpit about 5-foot long. The decks would be thatched with Salt Hay and I would lie on my back until I sat up to shoot over the bow. Since it would be sheathed in plywood, its beam would be about 4-feet and its LOA would be a bit under the sheet-and-a-half total of 12 feet. The sides would have modest flare and its shovel nose, rising from a gentle sheerline, would keep some spray down; its bottom would have just a few degrees of deadrise at the transom and a little bit more up forward. I used my sketch to loft the plan and profile views full-size onto 2 pieces of Homasote that I leaned up against the inside wall of the garage where I was building. I then built a ladder frame of 2x4s, leveled and screwed down to heavy saw horses, upon which I could fasten the boat’s frames. Much of the final design was determined during the building process, with levels, mason’s twine, and fairing battens. As I recall, floor and deck frames, the keelson, cockpit purlins, et cetera, were oak. Instead of separate chine logs and inwales, I used single pieces of Phillipine mahogany for the sides. Everything was fastened with galvanized wood screws and Weldwood Plastic Resin Glue, even the quarter-inch marine plywood sheathing – I did not appreciate the many advantages of bronze ring nails until it was too late. When built, I covered it with 10-ounce ‘glass and polyester resin. Before laying on the cloth, I ran an 8-inch wide swatch of 1-1/2 once matt (CSM) down the keel for added protection. I installed a bronze floor drain and galvanized cleats fore and aft. The bow handle I had scavenged from a wreck I found in a saltmarsh somewhere. The coamings, thatch rails, transom lifting handles and motor board were of oak. The oarlock stanchions were lengths of 1/2 ” pipe (originally chromed brass). The oars stowed in chocks up under the decks. The single 3/8″ plywood floorboard was removable – held in place with a hidden oak catch that engaged when you slid it forward just right. 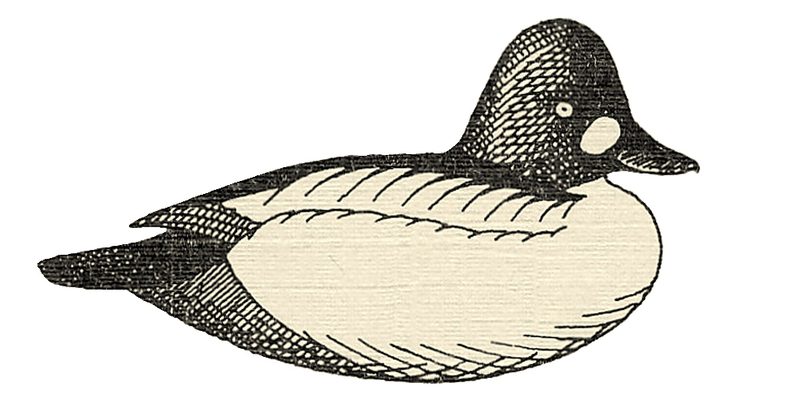 This drawing – of me thatching my first grassboat – has been used by South Shore Waterfowlers for numerous promotional purposes. This boat was designed for shooting over the bow. The deadrise increased going forward – it rose nicely to meet head seas. The forward stool rack had no hardware and stowed under the foredeck when gunning. The boat did everything I asked of it. I pushed it with a 9.9 Johnson. It handled well, drew maybe 3 inches, and hid easily. I sold it after a few years only because I needed/wanted a 2-man boat. Finally, in addition to all of the lessons I learned about boatbuilding with this grassboat, I also learned an important lesson about parenting – from another of my creations. I am guessing it was late-October or even early- November in 1983. The grassboat had seen its first year in service and I had just a bit more service in as a father – of my first-born Emily. It was a lovely fall day – sunny and dry and windless – the perfect day for painting a duckboat. Susan was off and Emily and I were at home, enjoying each others’ company. Coming up against her second birthday, she toddled about with a clear command of terra firma; she did not need to be held or carried, so…why not put a fresh coat of Parkers on the grassboat? It would not take long. The boat needed a coat after only a single season because its initial paint job was flawed. The exigencies of my schedule at the time had forced me to paint it outside and not long before nightfall. And the nightfall brought with it a heavy frost. While its bottom had been painted earlier and had cured properly, the deck paint was compromised – blotchy and dull and downright unsightly – certainly not “Bristol fashion”. So, out came the 80-grit and the paint and a brush. I wiped everything down with thinners and began the transformation toward a uniform dull sheen of Parkers Marsh Grass. Emily played close nearby – a perfect idyll – she in her world of creativity and imagination and I in a favorite task – my own head swimming with visions of cupping Black Ducks and wheeling Brant. Surely, it seldom gets better than this. Except. I had not anticipated every possibility. As gentle as the sun was on me and the grassboat and the Parkers, it was a bit chilly on a certain two-year-old. Trying to accomplish all of my responsibilities responsibly, I had made sure Emily was warm. Luckily, a friend had knitted – crocheted? – a beautiful off-white (natural) woolen sweater for her. Unluckily, though, it was with that very same beautiful off-white woolen sweater that my one-and-only daughter developed an interest in the grassboat. Soon enough, the sweater, too, enjoyed a fresh coat of Parkers Marsh Grass. Out came the thinners. Copious amounts, in fact. Soon enough, I was wringing the discolored thinners out of the intricate wool. Ultimately, I believe both the grassboat and the sweater came out looking like new. In any event, this early lesson in the dangers of multi-tasking prepared me for the technological onslaught we all faced in our futures. And, of course, I learned to love Emily more and more with each passing duck season. Hello Steve, John Sheaff suggested that I visit you website and I am glad that I did. Last fall I purchased a 12 foot Barnegat Bay Sneak boat that has paperwork that shows that it was built in 1964 by one John Boris for Gus Heinrich. Needs some minor work such as replacing the cover, minor fiberglass work and painting. Otherwise looks to be sound. Guess i’ll find out more when I try it out on Oneida Lake. Thanks for your site. Enjoyed looking at your work.